Rock-a-Good-Bye Baby! Pow! Pow! Yikes. Professional Comedian and TV Funnyman Nick Swardson does the voice for our short in this episode, and we hope to see some fun folks in our other shorts later in 2014. 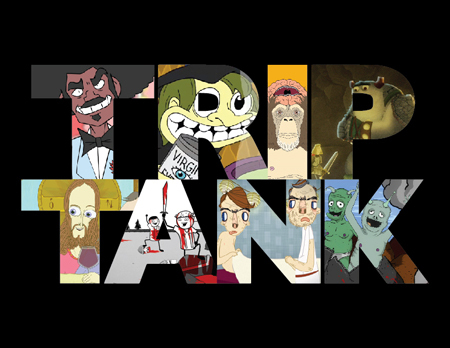 There are a ton of other funny shorts in this first episode of TripTank, too. Watch ‘em all! Or just watch ours over and over again on repeat like we’ve been doing. Yeah! Yeah but hid he come five times or six? Now did he have five kids or six? None actually. He’s shooting blanks. Video not available in Canada….. Gun in his pocket? How can one have pockets without wearing pants? Chap seems to have a rather unclear picture of the reproductive process. (You really want a rifle, preferrably scoped, to shoot down the storks).